For the women of Brahmondiha village, Self Help Groups (SHGs) are much more than a mere instrument of saving and credit. They are a vehicle to reclaim their identity and dignity. A medium to transform “loose” characters to models for younger girls and women. Deep in the undulated forested landscape of Bankura district in West Bengal is their village. They live not far from the so-called ‘developed mainstream’ yet miles away from empowerment and access to information. In the Brahmondiha panchayat, women are shaking the very roots of age-old beliefs, societal norms and discrimination. PRADAN came to work with us and organised an exposure visit to some Adivasi villages in Jharkhand where women had come together into SHGs. They were born amidst poverty, like us yet there was a sense of determination and belief in them. They had collectivized and they were strong. The first thought that struck us was, if they can then why not us? We knew the time had come to start a new narrative. 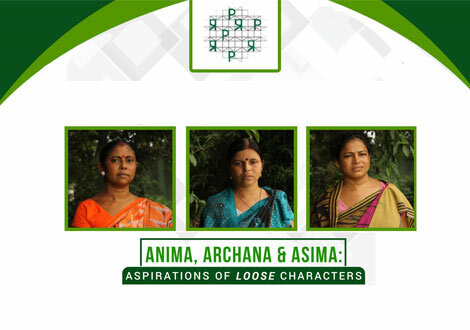 That is how Anima, Archana and Asima and about 300 women like them, from marginalised Scheduled Caste communities, stepped out and started their own journey. They came back to Brahmondiha with conviction to start a movement exclusively for women like them. SHGs proliferated – each hamlet saw women sitting in groups and discussing pertinent issues, every week. Progress was slow but they were persistent. Implementation of Government schemes was riddled with corruption. The women approached the officials in the panchayat and the district with concrete written plans. They collectively demanded work under MGNREGA for the very first time. They started engaging with Anganwadis too and as time elapsed, they began conversations with families where women suffered domestic violence. The opportunity for them to test their mettle came with Integrated Participatory Planning Exercise II (IPPE II) under National Rural Livelihood Mission. The government officials asked us to submit our village development plan in 30 days. Simultaneously, came the jibe– “these ‘women’ will never be able to make it”. But, that strengthened our conviction. We submitted the plan the following week! We slept little and ate little. We visited every farm and nook and corner of the villages, held meetings with all families. Villagers remarked that we were working like Goddess Durga with 10 hands!” exclaims Archana. Work started as per the plan. SHG women, as a collective, were at the forefront. The Block Development Officer (BDO) was so impressed with their work that he arranged a separate room in the Panchayat office building for them to conduct their meetings and to keep their records. Twenty-two years back I came to this village after my marriage. Removing my veil and draping a sari with pleats was considered obscene. All my life I have been called “Dhanar Bou” (Dhananjay’s wife). When I finally discarded the veil and wore my sari differently, I was called a “loose woman”. How these four years in SHGs have changed our lives! People call me Anima or Anima Di now, in this village and beyond. We have our own identities, and are not just somebody’s wife or daughter-in-law. My association with Brahmondiha Matongini Sangha has helped me change so many notions in my own head and among the villagers. The old lady next door (who used to taunt me as “loose” some years back) got her two sons married last year. As I went to meet the new brides, she told her new daughters-in-law to be like me- independent and fearless! My eyes were moist.